This is one of the best clay pot projects to give as a gift. Everyone seems to love butter dishes and jewelry boxes. They're fairly easy to make, and they look really stylish when they're finished. My wife has one of my jewelry boxes, and a we have a butter dish in the kitchen. It's one of the few clay pot projects, other than mugs and bowls, that we use almost every day. It sits out where you can see it and really warms the room. In the photo is a butter dish with a carved lid and a little twisting decoration on the top. The design for a jewelry box or butter dish is the same, so I'll refer to it as a butter dish for simplicity. There are just two parts to a butter dish: the dish, and the lid. Let's start with the dish. The dish portion of a butter dish is simple. It's just a small, shallow bowl. That's it. You can let it dry until leather hard. Then either trim the base on the wheel, or simply smooth the bottom and press the center in slightly so it sits flat on a table. Be sure to measure the dish while it is wet so you can make the right size of lid. To make a lid, throw the same sized shallow bowl as for your dish. Then, for the rim, create a small lip on the inside of the rim. Measure the lip so that the rims of both sides fit together, and the lip of the lid fits inside the rim on the dish. This way your lid will stay centered over the dish without sliding off. Dry the lid until leather hard. Then, recenter it, and trim the excess off the top and edges. You can carve a design into the top or even add a handle. Really, the hardest part is getting the two pieces measured right and fitting them together snugly. When both pieces are leather hard, check the fit. If it isn't perfect you can sometimes trim one or both slightly to improve the fit. If it's extremely tight or loose, you'll have to throw another lid. 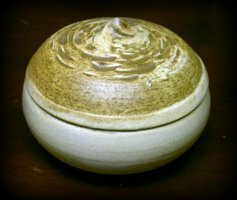 The key to making a nice butter dish or jewelry box is the design. Work with the shape and the texture of the lid to create the feel that you are looking for. Good luck and Happy Potting.